Barbara, our licensed optician, has worked in our Mansfield office for 10 years and receives a lot of questions on what are the options for lenses and why do the prices in lenses vary so much. Like all things in life, there are many options and some have added benefits to provide improved vision and comfort. This article goes over features you should consider on your next pair of glasses. These added benefits can add costs to the lenses but provide a clearer, sharper image and lighter glasses. Those who wear glasses full time should consider those options since they need to wear them from morning to night. While those who take them on and off and tend to lose glasses may suffice with a basic pair of glasses. If you are going to wear them full time, the additional benefits are worth their expense. Some binoculars are $10 and others are $300 and they are both called binoculars but the difference is the optical quality. How well do you want to see? It is important to be well-informed while purchasing eyeglasses – they give you sight after all! There are so many ways to customize your glasses, it is helpful to have every resource available to custom fit your prescription to your life style. There are several different lens options to take into consideration when making an investment in your visual needs. 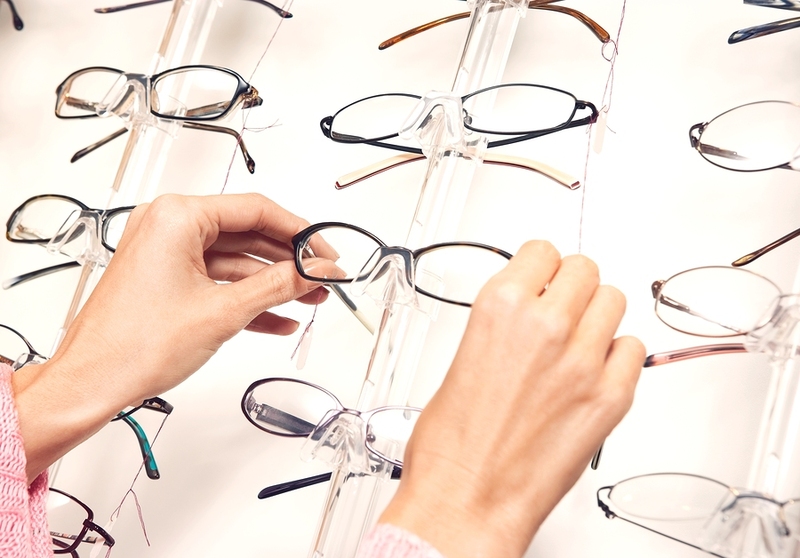 Choosing the right lens material for your needs is the first step in purchasing eyeglasses. The lens material provides the basic building block for your glasses. The most common lens materials are CR39, polycarbonate, and high index. CR93 is a basic plastic that has been a popular lens material since its introduction in 1947. It is the most affordable option for eyeglasses. Polycarbonate lenses are lighter and thinner than CR93. These lenses were initially introduced for use in safety glasses, but are extremely popular for regular eyeglasses today. High Index lenses are the thinnest and lightest lenses and offer the best cosmetic appearance for a higher lens power. These lenses are ideal for those with a high level of refractive error who do not want extremely heavy eye glasses. What are progressive lenses? Progressive eyeglass lenses are an alternative to bifocal and trifocal lenses. These lenses allow you to see at all distances, without the obvious indication of a visible line like traditional bifocals or trifocals. The progression between lens powers is seamless and invisible to anyone not wearing the lenses. Our lifestyle today requires us to see at all distances (reading glasses, distance glasses, computer glasses, etc. ), progressive lenses are the simplifying solution that you are looking for. Selecting the best progressive lenses will ensure that your glasses meet all your visual needs. Varilux lenses were the very first progressive lenses, invented in 1959. They are still a leading progressive lens option and specialize in providing clear vision that does not leave you feeling off balance or unsettled when moving your vision between lens powers. These lenses have the various lens powers in fixed, predetermined locations on the lens. Digital progressive lenses and digital freeform progressive lenses are even more advanced options for those who need multifocal lenses. While traditional progressive lenses have their various powers at set locations on the lens, digital progressive lenses allow you to customize where the powers lie on your lenses. This allows a deeper level of personalization if you find traditional progressive lenses do not fully meet your needs. The lenses are completely custom made to your eyes and offer the maximum amount of high definition, throughout the lens. There are different lenses designed for specific tasks – your lifestyle will play a big part in finding the lenses that best fit your visual needs. Some lenses have wider channels for easier adaptations. Other lenses have a larger reading area for those who spend a lot of time focusing on close up tasks. An optician, an eyeglass fitting specialist, can help to determine what lens would be the best option for you, as there are many different brands of progressive lenses. When selecting the multiple lens coatings available, on the top of your list should be anti-glare lenses. Why would you need anti-glare? Anti-glare lenses eliminate reflections in your glasses. Anti-glare and anti-reflective (AR) are two different terms for the same coating. This coating makes the glasses appear more transparent, and minimizes glare from light that can obstruct your vision. This is especially important for those with a high degree of refractive error. The higher the lens power of your glasses is, the more prone you will be to struggle with glare in the lenses. Anti-glare lenses give you 8% better vision because you do not have to fight through the glare. Anti-glare glasses allow others to see your eyes more clearly and allow you to see the world around you more clearly as well. The difference is particularly pronounced when looking at a screen for an extended period of time or while driving at night. Anti-glare lenses are a portable alternative to anti-glare screen protectors for cell phones and computers, and are proven to reduce eye strain and discomfort. AR lenses also allow for improved night vision by letting the maximum amount of light into the eye. This minimizes glare from other sources, like headlights while driving. There are several different types of AR coatings that vary in quality. Generic AR coatings minimize glare at an affordable price tag. These coatings are often applied to large quantities of glasses in batches. High end AR coatings, such as Crizal, allow the maximum amount of light through the lens. This provides the best resistance to glare and often comes with a diamond coat, which also prevents scratches and other damage to the lenses themselves. High end AR coatings, like Crizal, are more expensive but they provide the highest quality anti glare technology. Computer glasses are a great option for those who do not need to wear glasses all the time, but experience eye strain and irritation from prolonged exposure to a computer screen, cell phone, or television screen. These screens are all lit by blue light, which has been proven to cause eye fatigue and to disrupt normal sleeping patterns. Glasses for computer use are offered in prescription or over the counter powers, depending upon your need. They are even available with no power at all, to protect your eyes from harmful blue light even if you have perfect vision. Computer reading glasses are becoming more and more of a necessity as we spend an increasing amount of time in front of screens every single day. The best computer glasses will improve your vision in the intermediate zone, farther than reading but closer than driving – this is where the computer lies. Computer glasses can also be incorporated into progressive lenses. Particularly in an office environment, it is common to spend a lot of time alternating focus between a computer screen and small text on paper. A progressive lens with computer distance towards the top of the lens, and a magnifying bottom portion for small text provides a solution to make office work less strenuous on the eyes. There are several different coatings that can be applied to your eyeglasses. These coatings include AR, as discussed above, UV, tints, and scratch protection coatings. Depending upon your lifestyle, these coatings can be great tools to make your glasses work better for you. UV coatings protect the eyes from the sun’s harmful rays. While you may associate UV protection with sunglasses, regular eye glasses can be coated with a UV protection agent as well. This is perfect for those who spend a lot of leisure time, or work, in the outdoors. Tints can be applied to lenses and will change the color of the lens. This is can be beneficial for improving vision in certain environments. For example, those who often work outside may prefer a pair of tinted eyeglasses to wear while working. There are lots of tint colors to choose from. Scratch resistant coating is available to prolong the life of your eyeglasses. For anyone who is prone to dropping their glasses, scratch resistant coating is the best investment to be made to extend the life and quality of your eyeglasses. Photochromatic lenses, often referred to as “transition” lenses, change their tint based on the amount of UV that they are exposed to. These lenses protect the eyes from UV damage. UV rays also cause the lenses to darken for increased comfort. Photochromatic lenses are available in all lens materials and are good options for those who do not want their glasses to be clear while indoors, but prefer a darker lens when exposed to UV rays. No matter what type of glasses you need, our licensed opticians are happy to help you on your path to finding the perfect pair by sharing their knowledge. While you know your lifestyle best, licensed opticians know glasses best. For some, one pair of glasses can do it all. For others, the best optical option is multiple pairs of glasses. Talk to one of our licensed opticians today to determine which qualities are the most important for your glasses.